Inspiring Views at the Luxurious Ritz-Carlton, Laguna Niguel - Family Fun! Disclosure: We were guests of the Ritz-Carlton, Laguna Niguel for purposes of this review. All opinions are my own. I couldn’t wait to get to the Ritz-Carlton, Laguna Niguel. It wasn’t just that we’d spent a few days at Disneyland, and I was ready for some down time away from all the crowds. I’ve always wanted to stay at this beyond beautiful resort. From the moment I started planning our trip, I was counting down the days until my husband and I, along with our son Harry, would be on the Ritz’s bluff overlooking Laguna Beach. I almost couldn’t stand looking at the photos on the Ritz-Carlton’s website—that’s how excited I was. The hotel sits upon a gorgeous spot on Dana Point, a cliff with views spanning the entire coastline. That alone was a big draw for me, because I love this part of Southern California. We arrived a little early for our room, and because it wasn’t ready yet, we opted for lunch at 180Blu—a casual bar and small plates style restaurant within the Ritz Carlton. The restaurant features a gorgeous veranda with panoramic views of the Pacific Ocean. As we ate, we watched the surfers below and the beautiful birds soaring overhead. I immediately ranked it among the best places I’ve ever had lunch. In fact, 180Blu was so breathtaking, I couldn’t wait to see what our room had in store. Ritz-Carlton Laguna Niguel rolls out the red carpet for kids! We didn’t have to wait long. Our room was ready by the time we’d finished lunch, right after the hotel staff had wheeled out a pirate’s treasure chest full of sand toys for Harry. They let him pick which he wanted to play with, and that extra attention was a big deal for him. He was instantly in love with the hotel from that moment on. Next, they led us to our room, which featured the same sweeping views as the 180Blu. We were immediately drawn to our balcony, admiring the beach below us and the beautifully manicured grounds of our breathtaking resort at Dana Point. Our room itself was beautifully decorated in sea tones—light blues and whites that made us feel like we were part of the ocean, not separated from it. The pastry chef had also created an incredibly impressive edible room gift out of candy and sugars, designed in a scene of sand, seashells, and fish. Such a warm beach welcome! 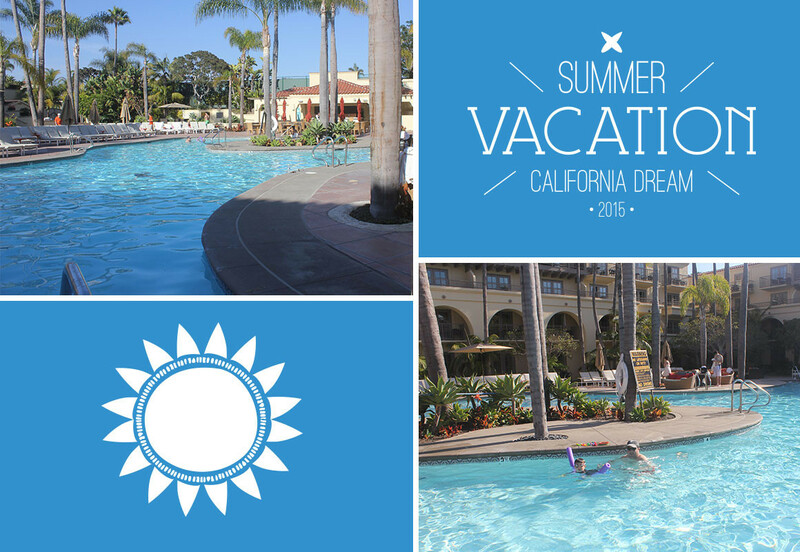 We savored our space, and then it was time to hit the pool and check out the beach. The Ritz-Carlton, Laguna Niguel offers a path you can hike down to the ocean or a shuttle. And bonus: hotel staff will set up all of your chairs, umbrellas, towels, and toys on the beach for you, so you don’t have to lift a finger. It was tempting to hang by the beach all afternoon, but Harry and my husband generally prefer pools, so we headed there to float in peace—the most ideal antidote to our packed days at Disney. The pool attendants were amazing, we felt pampered all afternoon. We also appreciated that the pools were heated, which isn’t always a guarantee in southern California. After luxuriating poolside for the afternoon, we headed back upstairs to our room for more time on our balcony—one of the most gorgeous views we’ve ever had. Later that night, we hired a sitter from Sitters in a Second, Inc., one of the Ritz-Carlton’s recommended luxury hotel babysitting services, so that my husband and I could celebrate our 8th wedding anniversary over dinner. We’d loved our experiences with the team at Sitters in a Second, Inc. when we used them in South Beach, Miami, and they did not let us down on the west coast. With Harry in good hands, my husband and I headed to Raya—the Ritz Carlton Laguna Niguel’s signature restaurant—for an over-the-top dinner with stunning sunset coastal views. Raya’s mix of small plates and signature dishes were locally sourced, and consisted of fresh seafood with Latin flair. Each dish was more delicious than the next. We could see clearly why locals from Orange County love dining at Raya. I still am craving the fresh Lobster tacos and spicy Piloncillo Prawns weeks later. The chocolate churros with pecan brittle ice cream and butterscotch pudding for dessert were a sweet kiss goodnight after an unforgettable dinner. Close to Disneyland and Legoland! Our stay was brief after our visit to Disneyland but fantastic. The next morning, we had to leave for LegoLand, but I would highly recommend a long stay at the Ritz Carlton Laguna Niguel for families of all ages who love a great resort on the ocean. So much for kids at Ritz-Carlton we can’t wait to return! We absolutely plan to return next year, when Harry is 5, and can better appreciate all of the cool Eco Adventure excursions that the Ritz offers for kids ages 5 to 16. While I relax and splurge on luxurious spa treatments. The hotel’s Eco Adventure Club offers an entire space for families and kids dedicated to local ecology, and they run captivating programs that connect kids with the unique ecosystems around Dana Point. I loved that the programs they offer have options for dropping the kids off or for participating and learning together as a family. I would love to have exposed Harry to the whale watching excursions and garden tours offered daily. Like most kids, Harry loves learning about fish and animals, so next year while I indulge in the Ritz’s amazing spa next time, these tours would be a perfect diversion for him to explore and learn what people can do to have a positive impact on the earth. We absolutely LOVE this hotel but with 5 kids I never considered it as a family resort. I am so excited that they cater to families as well. Definitely adding this to our list of family friendly hotels!! Thank you for sharing. Love your site too by the way- great pics! Any hotel that offers kids treasure when they first arrive is tops in my books. I love how the family programming at Ritz Carlton hotels is so inclusive – kids can do it alone or without their parents. Their commitment to marine life and those habitats is something I’d love to see from more hotels. I stayed here on the first night of my honeymoon before flying to Tahiti the next day. It was lovely! I’m glad to see it is great with kids too. This resort looks sublime. Love the treasure chest idea! I’ve never heard of that but it is such a sweet touch. That does look like an awesome place! I love hotels right on the beach, with the view of the ocean or the sea, and balconies where you can sit and listen to the sound of waves crashing onto the shore!